The CC1310 is a member of the CC26xx and CC13xx family of cost-effective, ultra-low-power, 2.4-GHz and Sub-1 GHz RF devices. Very low active RF and microcontroller (MCU) current consumption, in addition to flexible low-power modes, provide excellent battery lifetime and allow long-range operation on small coin-cell batteries and in energy-harvesting applications. 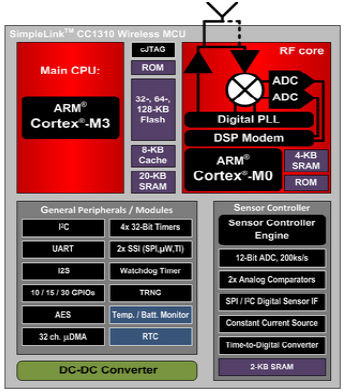 The CC1310 device is the first device in a Sub-1 GHz family of cost-effective, ultra-low-power wireless MCUs. The CC1310 device combines a flexible, very low power RF transceiver with a powerful 48-MHz Cortex®-M3 microcontroller in a platform supporting multiple physical layers and RF standards. A dedicated Radio Controller (Cortex®-M0) handles low-level RF protocol commands that are stored in ROM or RAM, thus ensuring ultra-low power and flexibility. The low-power consumption of the CC1310 device does not come at the expense of RF performance; the CC1310 device has excellent sensitivity and robustness (selectivity and blocking) performance. 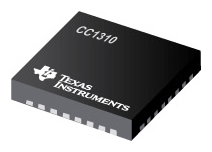 The CC1310 device is a highly integrated, true single-chip solution incorporating a complete RF system and an on-chip DC-DC converter. Sensors can be handled in a very low-power manner by a dedicated autonomous ultra-low-power MCU that can be configured to handle analog and digital sensors; thus the main MCU (Cortex-M3) can maximize sleep time. The CC1310 power and clock management and radio systems require specific configuration and handling by software to operate correctly, which has been implemented in the TI-RTOS. TI recommends using this software framework for all application development on the device. The complete TI-RTOS and device drivers are offered in source code free of charge.